Five cities in the San Gabriel Valley have each unanimously approved master bike plans that will expand bike lanes in the region. 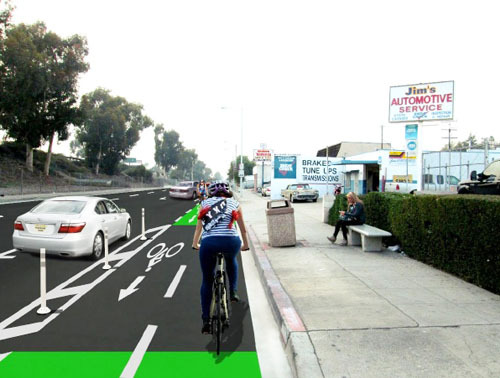 Bicyclists in the lead city, Monterey Park, may see some of these improvements as soon as spring 2015. Monterey Park’s city council approved its master bike plan during their Dec. 3 meeting. The plan proposes 52.7 miles in bike lanes and routes citywide including some in the city’s busiest streets, Garfield and Garvey Avenue at a cost of $2.2 million to be implemented over 20 years. Monterey Park Public Works Director Ron Bow assures the details regarding the design, construction and specific project implementations have not yet been fully flushed out. “What this plan does is position us for grant opportunities,” he told the council. “We realized there was a gap in our bicycle network, not only here [in Monterey Park] but in the entire San Gabriel Valley,” said Javier Hernandez, program director of the bike advocacy group Bike SGV. Bike SGV partnered with community based nonprofit Day One and with the five cities, Monterey Park, San Gabriel, South El Monte, El Monte and Baldwin Park to connect bicyclists throughout the region. In 2012, the nonprofit received $175,000 through the county’s Healthy Easting Active Living program to address obesity in the region. Bike SGV used much of the funding to develop the regional bike plan to address that issue. According to Los Angeles County Department of Public Health, 35 percent of adults in the region are overweight and 41 percent do not meet the minimum physical activity guidelines to sustain a healthy lifestyle. Currently there are only two bike lanes in the five cities. Not everyone is enthusiastic about the prospect of adding more bike lanes. Monterey Park resident Ulysses Ramirez said he lives, works and shops in the city, however he won’t bike in Monterey Park. The master bike plan proposes to expand Monterey Park’s current .7-mile bike lane on Alhambra Road to 17.3 miles of bike lanes along 23 roadways. The proposed paths include, Garfield Avenue, Monterey Pass Road, Garvey Avenue, New Avenue and Pomona Boulevard. Another 34.7 miles in bike routes are also proposed. Though supportive of being a more bike-friendly city, some residents were quick to point out problems they say won’t be solved by designated bike lanes alone. For example, one of the city’s most heavily traveled streets, Garvey Avenue, is also the street with the most bike collisions, according to the non-profit’s report. Many riders observed during the bike use survey were not wearing helmets and more than half rode on the sidewalks, according to the report. Resident Nancy Acuri said she wants the city to ensure bicyclists follow road rules such as stopping at red lights, refrain from sporadically changing lanes, driving without lights at night or endangering pedestrians on sidewalks. “I have seen examples of this in the last two weeks in Monterey Park,” she pointedly told the council. David Barron challenged the council to legalize bicycling on the sidewalks. “Either that or enforce the law,” he said sarcastically, implying the police don’t cite bicyclists for riding on the sidewalk. Andrew Yip told the council that bicyclists who do things like ride against the flow of traffic do it to ensure they are visible to drivers, but he thinks bike lanes would address many of the safety concerns people have. “It comes down to education and making sure we have the infrastructure available to make them feel safe,” he said. Bike SGV looked at nearby bike plans like those in Boyle Heights and Eagle Rock when creating their plan. “We looked at adopted plans in the region and looked at ways to lengthen them,” said Bike SGV Development Director Wes Reutimann. The plan also calls for adding bicycle parking at some of the city’s parks, library, civic center, commercial corridors and nearby schools. Bike SGV found that streets near East Los Angeles College attract the highest volume of bicyclists. Amy Ho, Monterey Park’s principal management analyst, told EGP the city has already received notice of a grant that would move forward the proposed bike lanes on Monterey Pass Road and Cesar Chavez near ELAC. However, construction won’t happen until some time in spring 2015, says Ho. Priority for the 71 individual projects in the master plan will not only be based on connectivity, safety, public need, costs and parking displacement, but “will be up to funding available, said Ho. “We are looking at the big picture, what should be done and can be done,” she said. According to Bike SGV’s report, nearly 1,900 trips are made on bikes daily in Monterey Park, but bike use is low compared to nearby cities. The next step for the nonprofits is to help the cities secure funding and to continue to educate residents in the region to encourage, enforce and evaluate bike ridership and safety. “We want people to see biking as a form of transportation not just as a leisure activity,” Reutimann said. December 18, 2014 Copyright © 2012 Eastern Group Publications, Inc.
Garfield and Garvey are bad streets for bike lanes. They are too heavily used, they have a lot of parking lot entering and exiting traffic and a lot of parked cars that will open doors without looking. In most cities bike lanes are placed on quieter residential streets that run parallel to busy streets. Laguna Beach does a good job of that. Nevertheless, it’s great that the city is addressing this need. It’s been over a year since this was approved and I haven’t noticed any new bike lanes in Monterey Park. The plan says implementation will be over the next 20 years, but has anything happened yet? Is there a timetable showing when streets will be updated with bike lanes?